Dwyer in September, 2012 playing for the Pittsburgh Steelers. Jonathan Avery Dwyer (born July 26, 1989) is an American football running back who is currently a free agent. He was drafted by the Pittsburgh Steelers in the sixth round of the 2010 NFL Draft. He has also played for the Arizona Cardinals. He played college football at Georgia Tech. Dwyer was highly recruited coming out of Kell High School in Marietta, Georgia. He was a four star prospect and many of the top NCAA Division I football programs expressed interest. Dwyer was awarded Georgia's Player of the Year (football). He initially made a soft verbal commitment to the Florida Gators but then decided that he preferred to stay closer to his family and committed to Georgia Tech. In track, he finished second in the state in the Class AAAAA 100-meter dash as a junior, with a time of 10.81 seconds, the second best time in the state of Georgia, and recorded a 4.48 in the 40 yard dash. He ran a career-best time of 10.70 seconds in the 100 meters at the 2006 GATFXC Coaches Invitational, placing first. He also placed third in the 200 meters at the USATF Region III Championships, with a personal-best time of 21.87 seconds. After committing to Georgia Tech, Dwyer got plenty of playing time as the backup running back to senior Tashard Choice. He played in all thirteen games during his freshman year. Choice battled leg injuries during the course of the 2007 season, which led to Dwyer rushing for 436 yards on 82 attempts and nine touchdowns. He was named to the ACC All-Freshman Team. Dwyer breaks past the Miami Hurricanes in 2008. Dwyer was named as a candidate for the Doak Walker award, an award given to the nation's best running back. Through the first four games of the 2008 season, Dwyer had 389 rushing yards on just 48 attempts with four touchdowns. Against Mississippi State, he recorded the longest touchdown from the line of scrimmage in Georgia Tech history, running for an 88-yard touchdown. He continued to have a good season with 147 yards against a tough Florida State defense, with a 36-yard touchdown run and a 66-yard touchdown. The following week, in a disappointing loss to the North Carolina Tar Heels, Dwyer recorded 157 yards on the ground, 85 of them coming in a long touchdown run where he again displayed his speed. Against Miami in a Thursday night game, Dwyer had 10 carries for 128 yards on the ground with runs of 35 yards and a 58-yard touchdown. The following week, he had a 60-yard touchdown, as well as a 23-yard touchdown against Georgia. He ended the game with 144 yards on the ground against a tough SEC defense and proved that he was one of the top backs in the country. He was the ACC player of the year and was a unanimous first-team selection as well as being the #1 rusher in the ACC with 1,328 yards rushing and 12 touchdowns. Former Yellow Jackets running back Tashard Choice said that Dwyer would have a great season in 2009: "He's going to be among the leading rushers in the country next year, and if he stays healthy, he could lead the nation in rushing. He's that good." On January 11, 2010, Dwyer announced he had decided to enter his name in the 2010 NFL Draft and forgo his senior season. Dwyer entered the 2010 NFL Draft and was at one point considered to be a top 30 prospect and in the top 3 running backs in the draft according to Todd McShay. He was questioned if he could adjust to playing in a pro-style offense, due to the fact that he spent most of his college career playing in a flexbone spread option offense at Georgia Tech. Dwyer's stock began to fall as questions about his weight and conditioning arose, including notably after the NFL combine (40 yard dash: 4.59, 3-Cone Drill: 7.56, 20-yard shuttle: 4.67, Bench: 15 reps). Dwyer tested positive for amphetamines at the 2010 NFL Scouting Combine, however it was later ruled exempt by the NFL after it was found that the positive test stemmed from his attention deficit disorder (ADD) medicine. Dwyer was drafted by the Pittsburgh Steelers in the sixth round (188th overall) of the 2010 NFL Draft. On September 5, 2010, Dwyer made the team's final roster cut. Dwyer made his professional debut in week 17 against the Cleveland Browns after the Steelers had built a commanding first half lead and rested Rashard Mendenhall in the second half. He rushed for 28 yards on 9 carries in the game. Dwyer again made the final roster cut after a strong showing in the pre-season. In the final game in pre-season, he rushed for 88 yards and got reps with the first team offense. With Rashard Mendenhall nursing a hamstring injury and backup Mewelde Moore out with a foot injury, Dwyer made his 2011 debut against the Tennessee Titans in week 5. He had a strong performance, rushing for 107 yards on 11 carries, including a 76-yard dash to set up a short Ben Roethlisberger touchdown pass. At the start of the 2012 season, Dwyer came to Training camp (National Football League) overweight, and was in question of making the team for his third season. However, he was able to bring down his weight and make the final roster cut for the Steelers. With Rashard Mendenhall and Isaac Redman out with injuries in a week 7 game against the Cincinnati Bengals, Dwyer started the game for the Steelers. He rushed 17 times for 122 yards in the game. The following week, Dwyer had 17 carries for 107 yards against the Washington Redskins. He became the first Steelers running back since Willie Parker in the 2008–2009 season to have consecutive 100-yard games. On November 27, 2012, Steelers head coach Mike Tomlin announced that Dwyer had earned the starting job for the remainder of the season. In the December 2 game against the Baltimore Ravens, he scored his first career touchdown on a 16-yard run. Dwyer was released by the Steelers prior to the start of the 2013 season. However, on September 9, 2013, the Steelers re-signed him due to LaRod Stephens-Howling suffering a torn ACL during their season opening game against the Tennessee Titans. 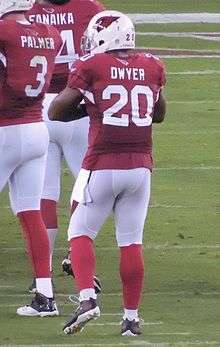 Jonathan Dwyer playing for the Arizona Cardinals. On March 12, 2014, Dwyer signed a one-year contract with the Arizona Cardinals. On September 17, Dwyer was arrested for domestic violence, and as a result the Cardinals deactivated him from all team activities, placing him on the non-football injury list. On Wednesday September 17, 2014 Dwyer was arrested due to allegations of two incidents at Dwyer's home in southeast Phoenix on July 21 at 8 a.m. and July 22 at 4 p.m., according to the Phoenix Police Department. The incidents concerned attacks against his wife and 18-month-old child. Dwyer was booked into Maricopa County Jail on one count of aggravated assault causing a fracture, one count of aggravated assault involving a minor, two counts of criminal damage, one count of preventing the use of a phone in an emergency, and assault. He was freed the next morning on a $25,000 cash bond and ordered to wear an electronic monitoring device. He was also banned from any contact with the alleged victims, travels outside of Arizona and any involvement with weapons, drugs or alcohol. All charges were dropped due to insufficient evidence. Dwyer admitted to the incidents during interviews with detectives but denied physically assaulting his wife and baby son. According to police, a search warrant was executed at his home. 1 2 Jonathan Dwyer (2008-08-28). "Jonathan Dwyer Bio - Georgia Tech Official Athletic Site". Ramblinwreck.com. Retrieved 2013-09-09. ↑ "Jonathan Dwyer - Stats". ga.milesplit.com. Retrieved 2016-05-18. ↑ "Three More Yellow Jacket Juniors Commit To NFL - Georgia Tech Official Athletic Site". Ramblinwreck.cstv.com. 2010-01-11. Retrieved 2013-09-09. ↑ Prisuta, Mike. "Dwyer making most of second chance". Steelers.com. Retrieved 2012-10-30. ↑ "Jonathan Dwyer release reportedly not coaches' doing". NFL.com. 2013-08-30. Retrieved 2013-09-09. ↑ "Pittsburgh Steelers sign Jonathan Dwyer, two others - ESPN". Espn.go.com. 2008-01-01. Retrieved 2013-09-09. ↑ "Cardinals sign Jonathan Dwyer, Ted Larsen, Marcus Benard | ProFootballTalk". profootballtalk.nbcsports.com. Retrieved 2016-05-18. ↑ Gittens, Hasani (September 17, 2014). "Arizona Cardinals RB Jonathan Dwyer Arrested for Assault". NBCNews.com. Retrieved 2014-09-17. ↑ "Jonathan Dwyer of Arizona Cardinals arrested on two counts of suspicion of aggravated assault". espn.go.com. Retrieved 2016-05-18. ↑ "NFL's Dwyer arrested on domestic violence allegations - CNN.com". edition.cnn.com. Retrieved 2016-05-18. ↑ "Police report says Jonathan Dwyer of Arizona Cardinals head-butted, punched wife and struck young son with shoe". espn.go.com. Retrieved 2016-05-18. Wikimedia Commons has media related to Jonathan Dwyer.